Yogis, Yoginis and Yoga Lovers, let's Gather! Join Nina Simone at Southwest Atlanta Yoga Studio as we ring in the Vernal Equinox with 108 Sun Salutations! Why 108? 108 is an auspsicious number that has mystical and spiritual meaning sacred to Yoga practitioners and other religious practices. In short, a practice of 108 repetitions is a deep activation on many levels and provides catalyst for change. Want to learn more? Join us on the mat! This is a great opportunity to set intentions, begin a new chapter, or have a nice jumpstart in your yoga practice! The 108 practice creates and strengthens the bonds within our yoga community. When we flow together, we grow together! This practice is for everyone, beginners and seasoned yogis! All you need is your breath! 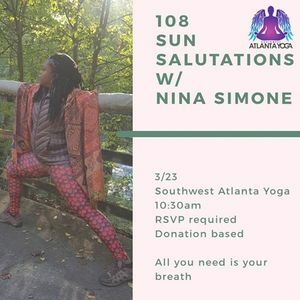 Nina Simone is a 200 hour Yoga Alliance Certified Tantric Hatha Yoga Teacher. She completed her training with Vira Bhava Yoga, whose teachings are based on Sri Vidya Tantra Yoga. 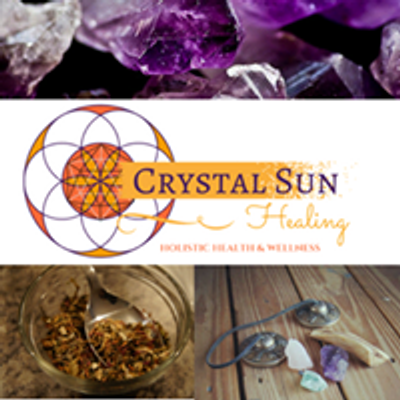 She has been teaching yoga for 3 years and loves to integrate her Martial Arts, Qi Gong with her teaching style. The focus is always on the breath and moving the energy where it needs to go. Please be sure to bring a mat, a towel, a water bottle and your beautiful smile! We gather at 10:15-10:20am and Flow at 10:30. This gathering is donation based. Please RSVP with Nina or Toure.